SLOW DOWN AND ENJOY YOUR BREAKFAST! You're heard it since you were a tiny little tyke: "Breakfast is the most important meal of the day!" It's true! A delicious breakfast can set the mood for your entire day to come, and while some of America may 'run on, we here at Cambridge Naturals prefer things prepared a bit more slowly and with a tad more TLC. With that in mind, here are some great family-friendly breakfast ideas ranging from sweet and sticky to savory and spicy. Enjoy! This is one the kids will love! Start with some of our Siete Almond Flour Grain-Free Tortillas. Spread your fillings on one side (think Nutiva Hazelnut Spread, Fior Di Frutta fruit spreads, Once Again Creamy Almond Butter, Organic Living Natural Juice-Infused Strawberries, maybe some banana slices...), fold it over quesadilla/crepe style and pan-fry to golden brown on both sides in a bit of Full Moon Ghee. It doesn't get much easier than that, or more satisfying! Melt some Full Moon Ghee in your frying pan and beat some of our unbeatable Brookford Farm Eggs in a bowl. 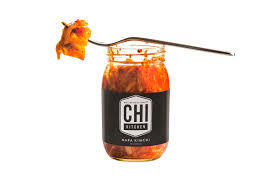 Add the eggs, some Chi Kitchen Kimchi, scallions, and shredded Neighborly Farms Sharp Cheddar. Cook 'til fluffy and serve with a liberal squirt of Bushwick Kitchen Weak Knees Gochujang Sriracha. Voila! The perfect breakfast for those who prefer to start their day with a little heat! Who doesn't love a nice stack of pancakes? I love them so much I couldn't decide on just one recipe suggestion, so you lucky folks get two! First up, soak some goji berries overnight in water (or dare I suggest simple syrup?). Prepare some batter with our Bob's Red Mill Paleo Pancake Mix (I hear it's best prepared with Brookford Farm Eggs and Nutiva Virgin Coconut Oil), add the berries, and break in some wafers of our Sunfood Cacao Paste. 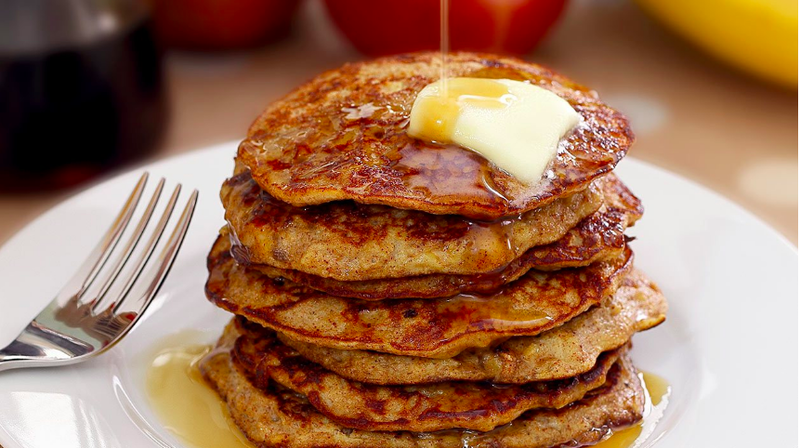 Cook 'em up and you've scrumptious Paleo Goji Cacao pancakes! Mmmm pancakes. Photo via Paleo Newbie. Or for a very decadent sweet-spicy-nutty-tart explosion of flavors, begin with our Mu Mu Magic Organic Cranberry Date Pancake Mix (oddly enough, this kind is best prepared with Brookford Farm Eggs and Nutiva Coconut Oil as well!). Chop up some Will & Rose's Pecans into that batter. Cook 'em up and slather them in Benito's Habanero-Infused Maple Syrup and Organic Valley European-style cultured butter. Cranberry and Habanero go fantastic together, believe it or not! Try it and you'll be convinced in no time! So there you have it. Put down that prepackaged bar, accept that your local bagel place won't miss you if you skip just one day, and sit down with a nice, homemade breakfast. Treat yourself! You deserve it! Every wondered how your genes can play a role in things like metabolism, bone health, inflammation, and food sensitivity? Our resident experimental science aficionado, Miles breaks down the basics behind genetic testing and how it can help you understand your body! And, from today (April 24th) through May 1st 2017, we're running an instagram giveaway with Nordic Naturals - win a bottle of Omega Memory with Curcumin and a bottle of Vitamin D3 Gummies, along with the Bliss Kit from local Orig3n! For more details visit our Instagram. As you may remember from high school biology, our cells contain bundles of information otherwise known as genes. Your genes were passed down to you from your parents, and help to determine everything from the color of your hair to how your metabolism operates, among much else. DNA is a long double helix with repeating molecules of nucleotides that make up your genetic code. In order to be expressed, your genetic code of DNA is read and converted into proteins in a process known as transcription and translation. Again, these proteins are what define your unique characteristics – they can be enzymes that help create neurotransmitters like serotonin, or the collagen in your skin. Mutations in our genes can occur. Most of the time, these mutations do not make too big of a difference in terms of how our biology operates. A common type of mutation is known as a single nucleotide polymorphism (SNP), which occurs when one of the base pairs in DNA gets changed around. This may result in decreased activity of the enzyme/protein for which the gene encodes, so sometimes SNP’s lead to disease states. Why would I want to test my genes? Sometimes when I help somebody choose supplements, I add the caveat, “we all respond to supplements in a bit of a different way.” There are numerous factors that alter how supplements may work in our bodies, ranging from nutrition, digestive health, and metabolism--all the way to psychosocial variables. A key part of this paradigm, however, is our genetics. Our DNA governs the way we metabolize and absorb certain types of nutrients. Hence, based on our DNA, some specific types of supplements might work better for our bodies than others. The concept of optimizing your health with supplements targeted to your DNA is an emerging area of focus called Nutrigenetics, and it’s a key component in the type of complementary and alternative medicine practice called Functional Medicine. With Orig3n Life Profile genetic test kits, your genetic information is collected from a cheek swab sample and analyzed for single nucleotide polymorphisms (SNP’s.) It can be cost prohibitive to analyze your entire genome, so only certain genes related to specific areas of wellness are analyzed. Orig3n Life Profile kits are not diagnostic tests and cannot be used for the diagnosis of disease. Nowhere in your results will it tell you that you are deficient in any vitamin. Instead, the words: “adapt, normal, or gifted” are used to discuss genetic activity. For example, if someone has a mutation in a gene linked to Vitamin D metabolism that is statistically associated with lower Vitamin D levels, the test results imply that he or she might need to “Adapt” based on their result. It doesn’t, however, tell you what your Vitamin D levels are! Nonetheless, when we find out more about the SNP’s in our genome we can make actionable conscious decisions to optimize our health. Orig3n Life Profile has five different genetic test kits available to us. They are as follows. Superhero – The “beginner” genetic test kit. Only analyzes for three genes related to muscle speed, strength and IQ. Fuel - Analyzes for SNPs in genes that contribute to food sensitivity, vitamin absorption, sugar craving and fat metabolism. Bliss – Analyzes genes related to mood and behavior imbalances. Think: neurotransmitter receptors and related enzymes. Aura – Skin health genes! Think collagen, hydration, and antioxidant genes that protect us from the sun’s rays. Fitcode – Analyzes genes linked to fitness, endurance, VO2 max and recovery, among others. Come in and ask any one of us about the Orig3n kits that are newly available to you! *These kits are non-diagnostic, do not require blood samples, and are not meant to be used to diagnose any disease nor prescribe any treatments. CODONOPSIS (Campanulaceae Family): "Poor Man's Ginseng"
Codonopsis (Codonopsis pilosula) is a sweet, nourishing root that comes to us from China where it is known as Dang Shen. You may also hear it called “Poor Man’s Ginseng” as it is often used as a substitute for the rarer, more expensive true ginseng, to which it has similar properties. This plant is native to East Asia where it can be found growing wild, but it is also commonly cultivated for medicinal use. Once the roots are three years old, they are harvested. In Asia they are not only used for their healing properties, but also as a food; the tasty roots are used as in ingredient in soups and other dishes. Codonopsis is becoming increasingly popular in western herbalism, where it is considered to be an adaptogenic herb. An adaptogen is a plant that helps an individual be more resistant to stress and also supports the adrenal and immune systems. In Traditional Chinese medicine it is known as a yin tonic, because it supports and nourishes the yin energy of the body through its sweet, cooling and moistening properties. As mentioned above this nourishing root is often used as a replacement for ginseng as a chi tonic — it gently increases one’s innate energy. It can be particularly healing for the spleen, blood, lungs, stomach and pancreas. Traditionally used for low energy, poor appetite, and debility after illness, codonopsis helps increase resistance to stress and builds strength in the body. It is often used in herbal blends for anyone who is low-energy and depleted, such as in cases of long-term disease, substantial blood loss, or after childbirth. It is a wonderful remedy for anemic people to help them build up and nourish their blood. Research has shown that it increases hemoglobin and red blood cell levels, and lowers the blood pressure. If someone is showing signs of paleness, dizziness, fatigue and constant low-energy, think of supplementing with codonopsis root. In Asia it is traditionally used for asthma, shortness of breath and deficiency in the lungs. As an immune tonic it is also excellent for people who tend to come down with every cold that goes around, and especially for issues that settle in the lungs. Codonopsis is an expectorant herb that can help to expel excess mucous, while also having the amazing ability to also soothe irritated mucous membranes. Finally, codonopsis can be a wonderful herb for children, who may naturally be drawn to its sweet and grounding taste. As a nourishing tonic herb, it is safe for people of all ages and constitutions to use. Add a few pieces of the root into the pot while cooking rice, or into soups/broths. The dried or fresh root can also be nibbled on its own. To make a decoction, add 1 tbsp. of the dried root to 2 cups of water in a small saucepan. Bring to a boil then lower the heat to a gentle simmer. Let simmer for 15 to 20 minutes, then strain and drink. This is a perfectly nourishing, grounding and earthy-sweet tea. I hope this simple trio of berries and roots will warm your heart and spirit over the winter months. Once blended, this will make enough for 3-4 servings. To make a single serving, place 2 heaping tablespoons of this mixture in 1.5 cups of water in a small saucepan. Bring to a boil then lower the heat to a simmer, cover, and let cook for 15 to 20 minutes. Strain and drink. Steph Zabel, MSc, is an herbalist and educator who helps urban dwellers connect with the plant world. She teaches herbal classes, is available for individual wellness consultations, and is also the founder of HERBSTALK, Boston’s community herbal conference. Learn more about her work at: www.flowerfolkherbs.com and www.herbstalk.org. It will be cold. It will be gloomy. It will be RESTORATIVE. Over the past several weeks, we've heard so many of our customers describe feeling inundated with physical, emotional, or political toxicity. The state of the world can take a deep toll on one's body and mind - immune health, stress response, sleep, you name it. While you're preparing to take meaningful action to clean up our planet and our society, it's also so important to also 'clean house' on a personal level and prepare yourself for dark times ahead. Now, I’m not being fatalistic here, talking about dark times... rather, we’re shifting into the barren, frigged, overcast months when some lucky animals get to hibernate. It will be cold. It will be gloomy. It will be RESTORATIVE. Remember that, ok? While it's so tempting to linger in our beds, we suggest taking action and choosing to feel better! Healthy bodies, healthy minds = can't lose. So, what are some of our favorite self-care tips for tough times? The real answer though: bid good riddance to toxicity! Purify, detoxify, rejuvenate and usher in the most life affirming foods, supplements, lifestyle and body care products. If the word detox conjures up gnarly images of cold-pressed veggie juices that make you shiver at this time of year, don’t fret. There are plenty of warming ways to fuel the body and release all that toxic gunk (think: nourishing soups and teas.) In the next few blog posts, we’ll share some ideas with you on how to purify your phenomenal vessel from the inside out and the outside in, but for now, here are some quick and simple ways to get started! A pot of Pu-erh tea - one of our favorite restorative rituals. Photo via Rishi Tea. To start (and this one won’t cost you any money,) we encourage you to take three slow deep breaths every time it is all feeling like too much. Just three mindful inhalations and exhalations. See how good that feels? Make yourself a pot of tea and DRINK IT slowly. Here are some tea suggestions from a few of our brew-loving staff members: Caleb, Rishi Pu-erh; Brenden, Guayusa tea; Jess, Organic India Tulsi tea; Caitlin, Traditional Medicinals Nettle tea with 1tbsp South River Dandelion, Leek Miso; Vicki, Mugwort tea from the bulk section; Bex (that’s me!) Four Sigmatic Reishi Tea. Stop in and ask us why we love these particular teas and brews! For a little something more, gift yourself one of the beautiful journals or notebooks from our lifestyle department and write down all the toxic, difficult feelings and actions you want to release this season. Then make a list of the nourishing feelings and actions you want to invite into your life, and the steps you can take to help manifest those dreams. Next level: Pick up a bottle of Cleanse and Fortify by Maine Medicinals, a surprisingly tasty tonic that “supports the gentle elimination of toxins.” With cleansing and restorative herbs as well as adaptogenic balancing herbs, this is a pleasant way to ease into detox. Keep reading the blog for ideas on how to filter out the crud and replace it with things that support your well being. We're here for you!